Instructions: Beat cake mix, water, vegetable oil, and eggs in a bowl for two minutes, until it is smooth with no lumps. Pour about a quarter of an inch of water into the bottom of the dutch oven. Write each person's name on a paper cup for identification later. 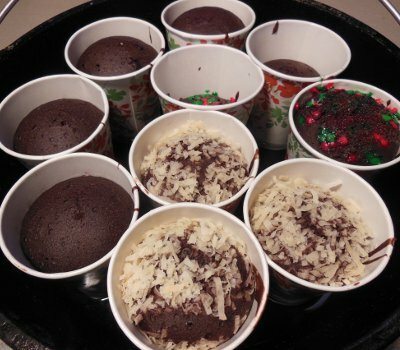 Pour cake batter into paper cups, filling each one with about 1/3 cup of batter. Be sure they are no more than 1/2 full or the cake will expand out of the cup. Each person adds whichever toppings they would like to their cupcake. They can either mix them in or leave on top. Place 10 paper cups with batter into the water bath in the dutch oven. Ten 3-inch diameter cups fit perfectly in a 12-inch dutch oven. Heat dutch oven for Baking to about 350 degrees. Bake at about 350 degrees for about 25 minutes. Poke a toothpick into some of the cupcakes. Poke it all the way to the bottom because the bottom tends to take longer to cook than the top. If it comes out clean, they are done.